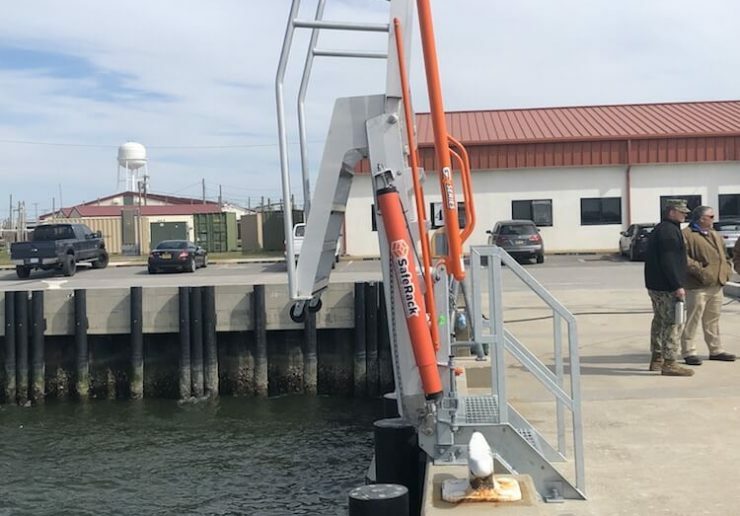 Barge gangways that can be fixed to a static structure like a complex platform system or to a mobile platform to allow easy operation and storage. 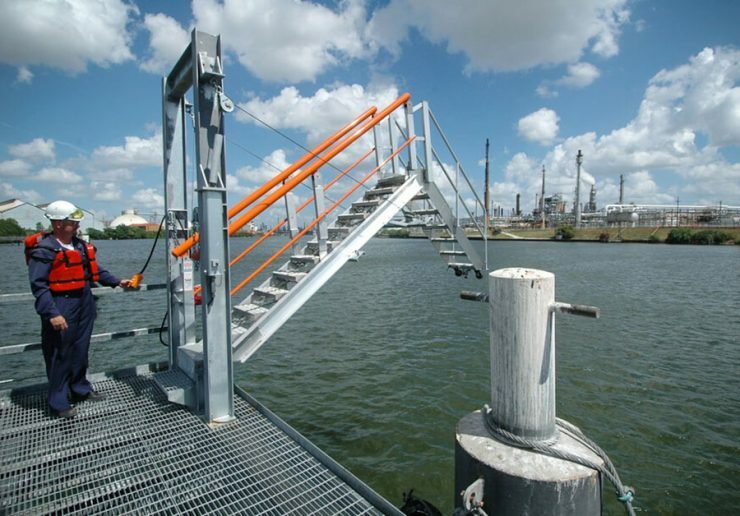 Custom marine ramps for safe access to and from barges and ships. 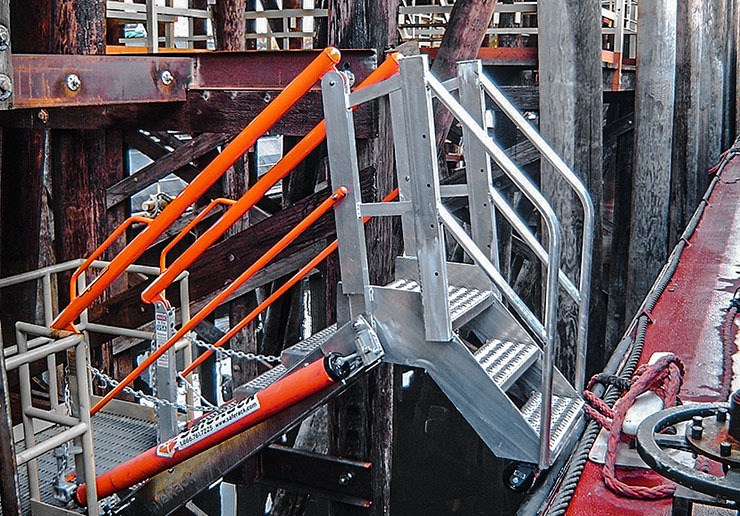 With a long history of building gangways, our patented brows and ramps are custom designed by our engineering staff to meet your application needs and built for durable and long-lasting performance in harsh marine conditions. 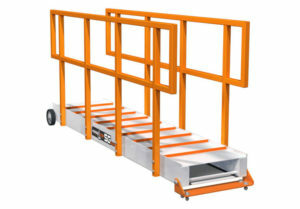 Dock gangways (also known as a ship brow or accommodation ladder) are the last thing an operator comes into contact with before stepping onto a vessel and the first thing they come into contact with when going back to shore, so they need to be rugged and dependable, but most importantly, they need to be safe. 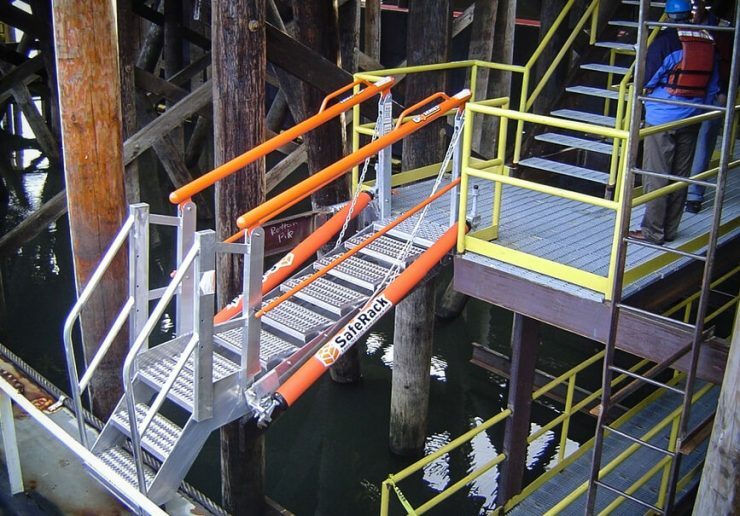 SafeRack’s aluminum gangways for barge access and ship access deliver precisely that. 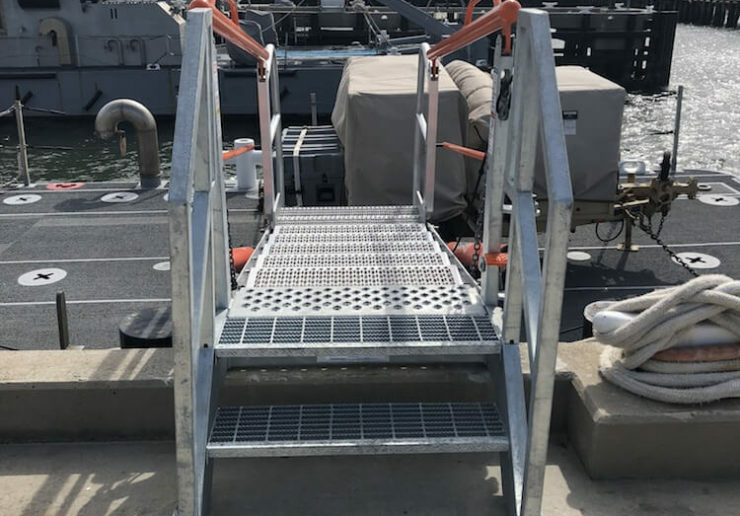 Our advanced, corrosion-resistant aluminum marine gangways are designed for OHSA-compliant worker safety, durability and reliability in marine environments and are built-to-order to your required length and specifications. 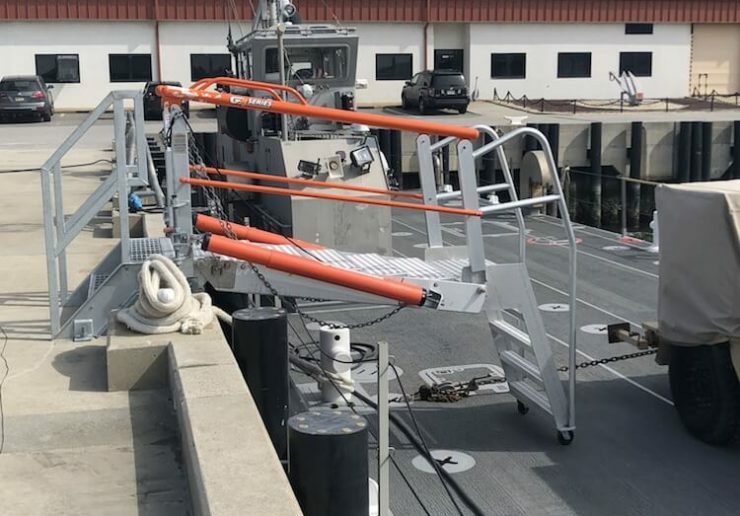 Constructed of durable marine-grade aluminum or galvanized or stainless steel, our vessel gangways are available in sizes up to 50’ in length and 5’ in width. Special-purpose gangways exceeding those measurements can also be built. 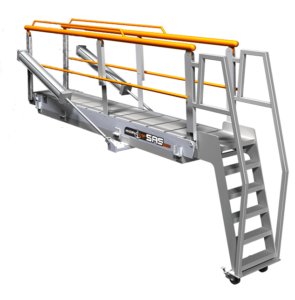 Whatever your need, SafeRack’s MarinaStep personnel can engineer the perfect product for your unique needs. 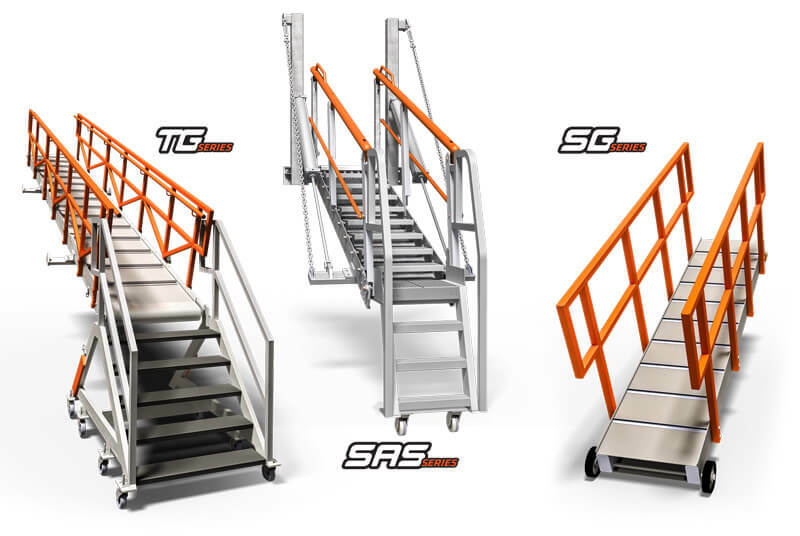 Available in lengths from 5 to 24 feet, the MarinaStep Self-Adjusting Stair Gangway (SAS) marine gangway is a perfect solution to reach both short and intermediate distances, providing a slip-resistant and level step for users along the entire length of the gangway. 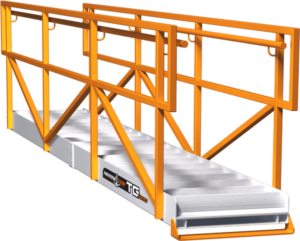 Our SG series aluminum gangways for barge and ship access use a rugged U-body construction to provide a live load capacity of 750 pounds and can be custom constructed to accommodate even higher load capacities. Our rugged U-body construction provides a standard live load capacity of 750 pounds and can be custom constructed to accommodate even higher load capacities. Additionally, you can choose from four different walk surfaces to improve your footing when operating at steeper angles.